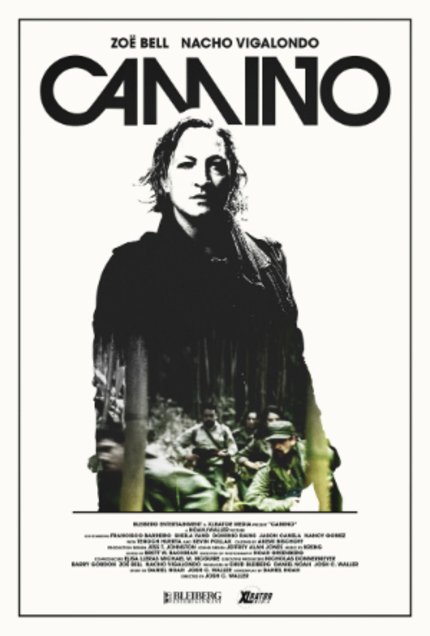 Stunt performer extraordinaire and frequent Quentin Tarantino collaborator Zoe Bell takes the lead in Camino, the latest from McCanick director Josh C Waller with Timecrimes and Open Windows helmer Nacho Vigalondo chewing up scenery in the villain role. Set in 1985, war photographer Avery Taggert (Zoë Bell) has built a solid career with her stark and honest imagery, all the while remaining emotionally distant from her subjects. When she embeds in the jungles of Colombia with a squad of missionaries led by a beloved and charismatic Spaniard known as "El Guero" (Nacho Vigalondo), she finds herself in the middle of a conflict as violent as any she's photographed. One night, she happens upon El Guero committing a heinous atrocity, capturing the vile act on film, an image with the potential to discredit and destroy El Guero. Knowing this brilliant psychopath will employ every tactic at his disposal to destroy that photograph - and the photographer who took it - Avery flees into the harsh jungle with nothing but the camera hanging around her neck to escape from missionaries twisted into violent guerrillas by the madman intent on destroying all enemies. Following a world premiere at Fantastic Fest, the first trailer for this one has just arrived. Check it out below! Cannot wait for this. Between this and the Greasy Strangler reviews SpectreVision is at the top of my excite-O-meter this week (I know this isn't an SV release, but Josh is the man). This does look good, nice camera choke kill. ~ If it is ANYthing like 1,000 Times GoodNight, it will be Exceptional. here's the imdb link if you are interested. Absolutely Magnificent film. ...rather grueling to get thru - but STELLAR. ~ If it's ANYthing like 1,000 Times GoodNight. .. it will be Special and Exceptional. here's an imdb link for above film if you are interested. Absolutely Magnificent film. ...noticeably grueling to get thru - but STELLAR and Well Worth searching out imo.